My dad’s not only a fantastic woodworker, he’s also the founder and chairman of the Heritage Craft’s Association. You might have heard of it. Due to this splendid family connection, over the Easter bank holiday weekend I had the pleasure of demonstrating on the HCA stand at the Ideal Homes Show in London. 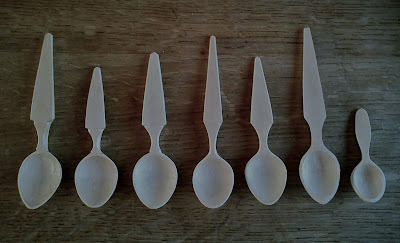 Two days of solid spooncarving! 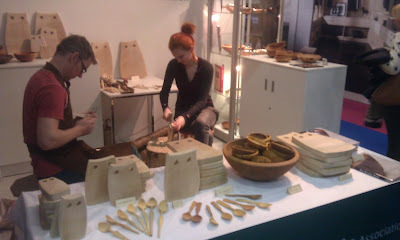 As my first experience carving spoons under the watchful eye of the public, I learnt several things. The eye of the public seems to enjoy watching a pretty girly wielding a large axe. Wielding a large axe in a hot stuffy indoor environment is incredibly wearing. I’ve been working on developing an eating spoon carved from straight grain wood which I enjoy both making and eating with, and spending a couple of days just carving eating spoons was invaluable. My weekend’s spoons. Some went exactly as planned, some were happy accidents, some were slightly less happy accidents, some aren’t quite finished yet, but all of them taught me something, and I’m finally starting to create some things that I truly like. I really like those 3 on the left. Really nice spoons JoJo! Previous Previous post: new year, new blog, new axe.